C Town City, Celtic match to be replayed at neutral venue - SABC News - Breaking news, special reports, world, business, sport coverage of all South African current events. Africa's news leader. One police officer and a supporter were injured during the scuffle with the unruly mob on Sunday afternoon. 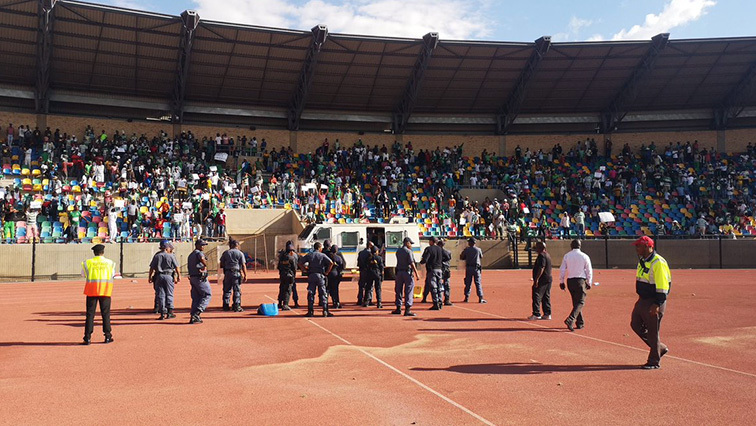 Eight people have been arrested following the disruption of the Absa Premiership game between Bloemfontein Celtic and Cape Town City at the Dr Petrus Molemela Stadium in Bloemfontein. Chaos erupted 23 minutes into the game. Supporters barricaded nearby roads with burning tyres and rocks. Celtic supporters want club chairperson, Max Tshabalala, out of the beleaguered club. Celtic Chief Executive Officer (CEO), Khumbulani Konco, has condemned what he calls “acts of hooliganism”. “We never expected this, but unfortunately this has happened. There’s another meeting again tomorrow [Monday] morning to discuss the matter. So, we will see how it goes. It’s an obvious one, we know people of Mangaung … There’ve been boycotts after boycotts. Maybe this one they are intensifying their boycott. This is the outcome of it,” says Konco. Police used stun grenades and rubber bullets to disperse violent supporters inside the venue. Meanwhile, the game will be replayed not later than Wednesday at a neutral venue. The game was called off by referee Victor Hlungwani. “The fans today they disappointed themselves. They are one of the fans that every other club looks to and you want to follow because they are behind their team no matter what, irrespective of the outcome. And it was a bit sad in today’s day and age you don’t expect police to shoot teargas because we’ve already had so many disasters in the past,” says McCarthy. This entry was posted on 15 Apr 2019,06:50AM at 6:50 AM and is filed under Sport, News, Homepage Latest Stories Slider. You can follow any responses to this entry through the RSS 2.0 feed. Both comments and pings are currently closed.